October is National Breast Cancer Awareness Month. The Atlas Collection on the second floor of Bracken Library is a valuable resource for researchers interested in maps related to breast cancer and other health issues. 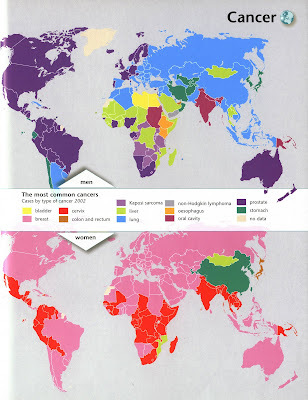 The Penguin State of the World Atlas (published in 2008) in the Atlas Collection features a world map showing the most common cancers suffered by men and women in each country (shown above). Not surprisingly, breast cancer was the most common cancer for women in many parts of the world. The atlas also includes a chart showing the differences in new cancer cases in industrialized countries. “In 2002, there were 10.9 million new cancer cases in the world, and 6.7 million deaths,” according to Dan Smith, author of this atlas. A graphic in the atlas shows the number of cases for each cancer in men and women. The call number for this atlas is G1021.E2S65 2008. The Penguin Atlas of Women in the World (published in 2009) features a map showing the incidence per 100,000 from 2002-2007. A chart identifies the numbers of incidences and deaths from breast cancer per 100,000 women in the United States from 200-2004. Another chart shows the incidence of breast cancer in industrialized countries around the world. The call number for this atlas is G1046.E1S4 2009. The Atlas Collection also includes The State of Health Atlas: Mapping the Challenges and Causes of Disease (published in 2008) and The State of Health Atlas (published in 1993). Atlas of Disease Distributions: Analytic Approaches to Epidemiological Data (published in 1988) and Atlas of AIDS (published in 1992) are also available from the Atlas Collection for research on health-related topics. The Science-Health Science Library in the Cooper Nursing Building also houses a collection of atlases related to disease and healthcare. Atlases from the Atlas Collection circulate for 28 days or longer. Maps and images from the atlases may also be scanned by the staff of the GIS Research and Map Collection (GRMC) on the second floor of Bracken Library. For more information about these resources, please contact the GRMC at 765/285-1097.